Shock encountered in a variety of etiological conditions represents a generalized disease of microcirculation and involves most capillary networks. As a matter of fact, it could be considered as a disease of the endothelial layer, and perhaps of the sub-endothelial tissues of blood vessels (1). Endothelial cells are capable of synthesizing a number of vasoactive compounds which may dilate or constrict the media, as well as triggering white blood cells and platelets from the circulation, also capable of releasing vasoactive substances (2). 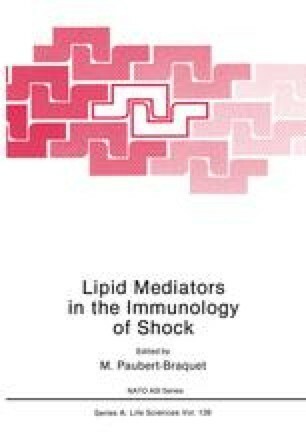 Under most etiological conditions, shock is preceded by loss of vascular tone in most resistance vessels, by increased capillary permeability to circulatory macromolecules such as proteins, and by excessive loss of plasma volume into the interstitial space. Consequently, blood pressure collapses and perfusion of vital organs is compromised, leading to further deterioration of body fluid compartments homeostasis (1). The excess fluid and plasma proteins within the intersitial compartment where oxygen and substrates supply as well as removal of toxic end-products of cellular metabolism are dependent upon the physico-hemical characteristics responsible for their diffusion in opposite directions in this compartment of extracellular volume, probably represents the first deleterious step leading to impairment of function in vital organs during shock, and the first pathophysiological event responsible for the irreversible nature of certain shock syndromes (3, 4).